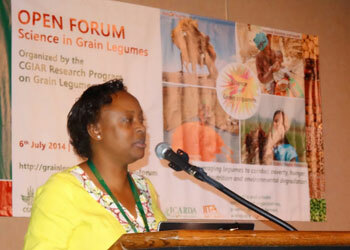 Dr Esther Njuguna-Mungai, Scientist - Gender Research, ICRISAT, speaking at the Open Forum. Scientists from the CGIAR Research Program on Grain Legumes and its partners showcased the integrated and collaborative efforts among the participating CGIAR centers and its regional and national partners in achieving the research outputs. Dr Damaris Achieng Odeny, Scientist Biotechnology, ICRISAT-Nairobi, highlighted the specific situation in east and southern Africa and the need to address the specific needs of the region. He pointed out that east Africa had unexploited germplasm and novel alleles from landraces which could be useful in the fight against poverty and hunger. ICRISAT scientists presented new opportunities for extra-early maturing chickpea and lentil varieties such as the introduction in rice fallows and new niches such as spring planted crop. They also discussed lessons learnt from Eastern and Southern Africa in managing aflatoxin contamination in groundnuts. Dr Esther Njuguna-Mungai, Scientist - Gender Research, ICRISAT, made a presentation on “Integrating Gender Research: Some ideas”, highlighting the status of gender research in the CRP on Grain Legumes. She informed that the Gender and Agriculture Network has designed a global study on gender norms, agency and innovations in agriculture and natural resources management.